Dragon Hill, a natural chalk hill (the flat top is manmade -- probably iron age) just below the Uffington White Horse (out of shot to the right). You have some noticeable uneven development in the sky area, how are you developing the film. I'm not sure I see it. The horizontal structure is the low-contrast cloud formation. I think that this was the second batch that I did in the SP-445. I generally use -- continuous inversions for 30s (~15 inversions), then 10s of inversions (~5 turns) after each minute. I know there is a very slight light leak down the left edge of the image which seems to have been solved by blacking out the bare wood of the camera back using a black marker pen! Well, it certainly needs some spotting, but I'm prepared to believe the sky is natural. Always open to correction, of course. The unevenness in the sky is more noticeable on the screen of my darkroom computer, actually I noticed in when not logged in when the image is displayed smaller, it was even more apparent. I can easily spot it here on a ASUS semi tablet computer as well and it's definitely not natural, it's 5 or 6 maybe 7 darker vertical strips across the horizontal skyline. You'd possibly loose it with some simple dodging of the sky and background landscape. Now that you point it out, I can see it. Any suggestions to avoid it in hardware (i.e. developing methods) rather than software? It's an agitation issue during processing, either during development or perhaps but less likely when adding the stop bath. Not using an SP-445 I can't be particularly specific but over-agitation is sometimes as bad as too little as it causes surge marks, so does particularly vigorous agitation. I'm assuming there negatives are fully fixed if not that's an outside possibility. A possibility is that it's distant falling drizzle which can look like this, although usually not along the whole horizon. Are you agitating front-to-back or left-to-right? Fast or slow? Perhaps changing to a couple of inversions every thirty seconds might help. Do you use a water bath before the dev? Opinions are divided on the usefulness of a water bath in tanks. Could it be that the slots in the SP-445 light-trap are behaving in the same way as 35mm sprocket holes sometimes do? This might be a possibility if the patches line up with the slots. And yes, a bit of blackening is a good idea on the Intrepid. My experience is that drizzle looks slightly different, not a series of spaced density irregularities You may be right about the internal of the tank causing streaming. Maybe others here using the same type of tank can comment (I know one has different issues). I was heavily criticised on another Forum for this uneven sky, however there really was a storm in the background and had a DSLR image that corroborated the conditions. 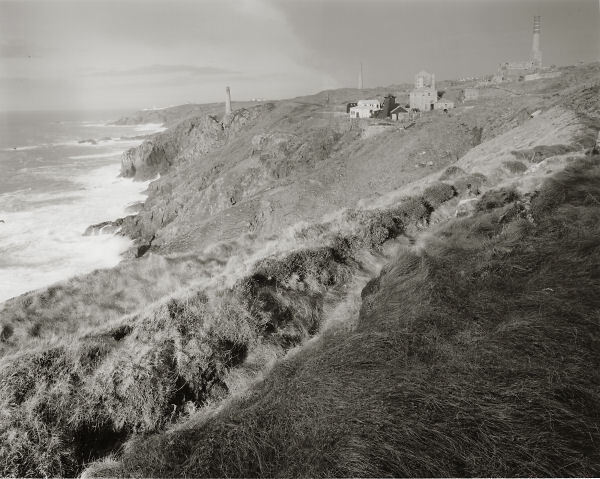 Levant Mine, Cornwall with Geevor in the background. I don't think there was any drizzle about that day, a bit misty, hence the red filter. I'll try to compare the locations, I did have a problem with the Mod54 if I used the twizzle stick instead of inversions (I never feel that the top on modern Paterson's is that secure -- much prefer the AP for small format). I do pre-wash to get rid of the anti-halation dye (usually 1 wash with 1-shot chemistry, 2 if I'm going to reuse the developer). I don't recall now which axis I rotated about -- at first I was rotating about the shortest axis, but then I saw somewhere that that is not a very good idea, so I switched to the "middle axis".